the board update has changed AGAIN bbcodes and/or parser (or whatever), and features like image embedding, spoilers, numbered lists are not working anymore or not properly. I perfectly know how this post of mine will be ignored, like all the previous ones about the opportunity of not updating the board "live", but only after having thoroughly tested the new release, and make d@mn sure that an update is actually needed at all. Consequently the only scope of this post is to make sure that you won't get away with "I didn't noticed" or "noone told me anything about that". he board update has changed AGAIN bbcodes and/or parser (or whatever), and features like image embedding, spoilers, numbered lists are not working anymore or not properly. Well.. please allow me a short justification before ignoring this post: I don't have the conditions to test each forum upgrade before applying on the live board. At most I do a complete backup to rollback in case some catastrophe happens. Sorry. The quote issue seems to be related to the theme. Didn't found a solution to this problem yet. Might help if you please clean the cache of your browser and try again or provide me a more accurate description to how I can replicate the issues you report. Sometimes it is a cache refresh that solves these things after an upgrade. Thanks (and sorry again for this trouble). Maybe a stupid idea but, how about creating a post / thread with all the usual suspects, that have made trouble in the past. Seems to be always or at least mostly to be the same problems over and over again. Wouldn't that be a quick way to test for at least the worst issues? Usually there is some administration, having problems with the same issue. So, be patient with new board "features". Just mention the issue w/o comments. There is no need to provide examples anyone just §@ç#ing attempting to formatting properly a post can and will notice them, and no, the cache of the browser has nothing to do with it. But no problem whatsoever, I'll simply start doing like everyone else does, like not quoting properly other people, not making lists or using codeboxes where appropriate, etc. As said, the intention was exclusively to let you know about the issue. When you reply to a topic, previous posts are NOT in inverted order (as it normally happens on all boards and happened on this one till lately). Also after posting from quick post, i do not end up at my new post, but at the top of the page. Don't mind either. But the behavior does have changed. and looking for "posts I made" or on the Advanced search if you select "As posts". The changes in bbcode/*parser/etc. makes (VALID TILL NOW) links containing brackets invalid. the link in first post was originally posted "properly" (since the previous board software INcorrectly parsed links containing brackets) by using the "link" tool (icon representing a chain link) and now it is m00t. I.e. not only the displayed text has been corrupted, but ALSO the actual address (unlike the OLD board link corruption that messed with the link and the display name but left the actual address recoverable). which was posted as a "clickable" link (not with the "chain" link tool but by the "standard" parsing of the board) has become NON-clickable! I hate this new "feature". Really seems to make harder to keep track of what was said. Some updates ago I noted that in private messages they removed the text from previous replies when we are composing a new message using the full editor. Crappy option, if I want to preview my message before sending it then I either need to open a second window or copy/paste the previous text to remember myself of what I want to quote and reply. I won't even start with my complaints about the cost of licenses with their addons. Every time the board is upgraded it will almost always force to renew the licenses of a perfectly functional addon to keep the functionality running. That is the reason why we don't have the nice hosting interface or the image gallery anymore, too expensive too keep. I don't think they care about us. No free / cheap alternity available? You see the difference, I am pretty sure they don't. as an example of how customer support should NOT be made (and when I am not enough angry I re-read it to get "charged" a bit). What I start to think (and this greatly saddens me . What I start to think (and this greatly saddens me :( ) is that you don't care anymore about us :ph34r:. I presume this is also "Not a bug". Just in case the message wasn't clear, IMHO the priority should be for INTEGRITY of CONTENTS (§@ç# the stupid add-ons), if the add-ons offer additional features over a SOLID base, then good, otherwise §@ç# 'em. I personally see MyBB as a better option, unfortunately the board converter is still on the works for quite some time now (since 2010) to bring support for version 3 of our software here. In either case, the version 2 of MyBB seems to be close for a release so it would be good to wait and see where they are headed. I like the fact that it costs nothing on our side. TLF has been using it with success, wouldn't be surprised if we eventually follow the same road. Vanillaforums was tried with filename.pro and my impression is that independent installs are very neglected and I worry about the potential security issues that go unfixed. Also, I saw no converter to port our data to this platform. Nuno, please refresh your view, I edited my previous post with important info the stupid board software REMOVES contents when posting! Yes, I agree. Most of the addons were deactivated since the past year to this part. The only ones that survive are the downloads portal and the links directory. These two things help a lot of people everyday, if it was possible to port them over I'd be a happy camper (then only missing to worry about solving the broken links but this is doable with enough time). Maybe a freelancer php developer can be hired to provide this task. Not even sure if a downloads portal exists for MyBB. Maybe a stupid question, but why do you care do much about the available converters for the different boards? Given that the available ones for this software, appearantly can't even handle the upgrades from one version to the next. Can it really get any worst? Maybe a stupid question, but why do you care do much about the available converters for the different boards? Given that the available ones for this software, appearantly can't even handle the upgrades from one version to the next. 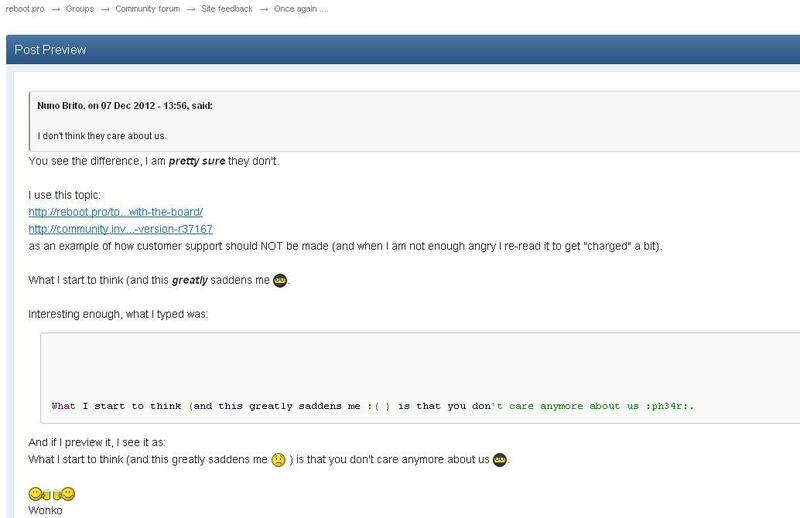 When switching to a new forum software there might be some interest in keeping the text from the conversations over past years. The current software handles upgrades surprisingly well, apparently it is only the old users that don't seem to digest ridiculous features new changes too well. From outside the box it looks, like you and mikorist need to write own converters always anyways. What is needed is to reapply small customizations that get overwritten. For example the logo and minor details. If we are not lucky, some of the plugins will no longer work and need to be upgraded when available. When a major version is released as it happened yesterday (3.3.x to 3.4.x) then I need to fix the theme and this is a tiresome task. These are things around the forum software itself but they are not related to converting the content to another format. Takes a while to slowly get things back into place and these new features don't really help much but I can't even change them to work as before. Ok, I'm trying out the myBB software once again and customizing a new website to try this out. So far setting up the site and customizing it was a fairly quick process. I'm now playing with their SEO module to see if it can replace our current configuration. Discovered one thing, i love, about this new version of the board software. After years, for the first time, i get clean bbcode, like it used to be, when clicking on "quote", instead of this terrible html mix. Only with enabled JS was this mess cleaned up in the editor lately. But then, my browser would constantly do mini lock ups during page loads or eat 100% CPU resources as long as reboot pages were open. Not to mention the crash of the browsers every couple of days. Hope this feature makes it into the next board software, whatever it might be. It is IMNSHO a VERY serious one. Thank you. This is a really annoying defect on the forum software. I'm unable to fix the forum software defect on my own, but managed to make the rest of the topic visible. This removes all the crazy formatting that might be messing the topic for any odd reason and places back clean text that will be rendered as intended. Thanks Wonko for bringing this up for attention. I had read that topic but did not noticed there was more text that was not being rendered. Not an issue in this case of trifling matters, but if it was a long post it would have upset me greatly.